This series follows Dr. Elizabeth Livengood – Anderson as she navigates her way through her year in an integrative medicine residency as the 2015-2016 STAIR resident. The last few months of my integrative medicine residency have zoomed by, with increased independence as a practitioner and exciting plans for next steps in my career. With much gratitude, I recognize the immense volume of patients I was able to see in one year, the priceless mentorship I received from both naturopathic and allopathic physicians, and the professional knowledge I gained about business practices and patient relationships. 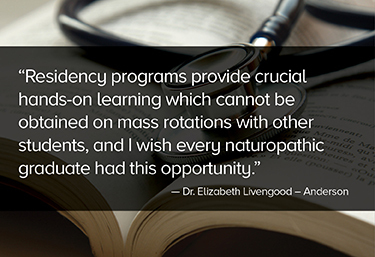 Residency programs provide crucial hands-on learning which cannot be obtained on mass rotations with other students, and I wish every naturopathic graduate had this opportunity. Since Hippocrates’ time, newly educated physicians spent many years observing, discussing, learning, and assisting at the feet of an experienced mentor. Residencies are the modern way to develop effective, well-rounded practitioners. This is the heart of medicine and truly the best way to learn. As an integrative resident, I spent time with both an OB/GYN and a Sports Medicine/Pain Physician. While learning from the sports medicine doctor, he shared that he finally felt ready to open his own practice after gaining “sufficient experience” through a one year general residency, a 3 year sports medicine residency, and a one year fellowship in pain management. Then, and only then, did he feel prepared to practice on his own. This is consistent with the apprenticeship model employed over millennia. So how important is residency? It’s imperative; but sadly, opportunities are scarce for naturopaths. Natural and integrative medicine has come a long way in recovering from the Flexner-Rockefeller suppression 100 years ago. Our education, testing, and licensing continue to evolve and produce highly qualified physicians, while residencies like the STAIR program offer modern, comprehensive training in the medical tradition. We need more of them, in both quantity and duration. Federal funding provides the bulk of post-doctoral training for conventional residencies in our country; however, integrative and naturopathic residencies rely entirely on private funding. A two-pronged approach to shrinking this disparity includes: A) our professional associations and sponsors lobbying for federally mandated insurance inclusion via Section 2706 and B) preservation/expansion of private funding via grassroots marketing. Medicare payments account for 40-50% of conventional provider incomes on average (along with 20% of our national spending,) but they do not currently cover natural therapies. Where Medicare money goes, residencies follow. Hence, receiving federal inclusion via Medicare should have the effect of expanding funding for integrative and naturopathic residencies in the future. For now, we are making small inroads towards fair funding by participating in new programs such as the Medicare Diabetes Prevention Program. Through Dr. Julie Gorman’s efforts, Revolution Health is the first naturopathic clinic to be included! Imagine a healthcare system where all types of providers have access to the highest quality training; where inclusivity and respect foster truly integrative healthcare geared towards patients’ best interests; and where patients have a voice in what type of treatment they receive. In the end, the patient is the one who has to implement the plan, whether it is a prescription, a surgery, or a natural therapy. Knowing when to use which is the essence of integrative medicine. The STAIR Integrative Residency Program is a CNME-approved, postdoctoral, naturopathic, medical education program under the administration of Bastyr University. Integrative Therapeutics is committed to supporting initiatives like integrative medicine residency programs because we believe everyone deserves options to choose their ideal path to health and happiness.